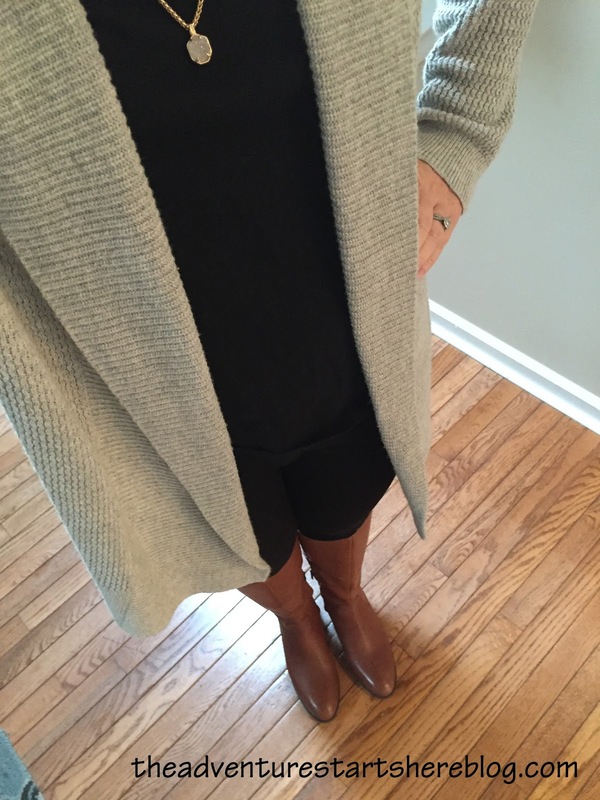 This week's Mommy Style is all about comfort, but then again, when is it not !?! Now that winter is here, there are many days where I'm just bringing Noah to school or swim, and then we are either hanging around the house or having play dates with friends. As a result, I'm choosing lots of jeans and t-shirts combinations so I am comfortable and not overdressed. We had some friends over for a super relaxed Sunday brunch. The kids played while we ate and chatted. I wanted to be comfortable and have plenty of room to eat lots and lots of carbs. 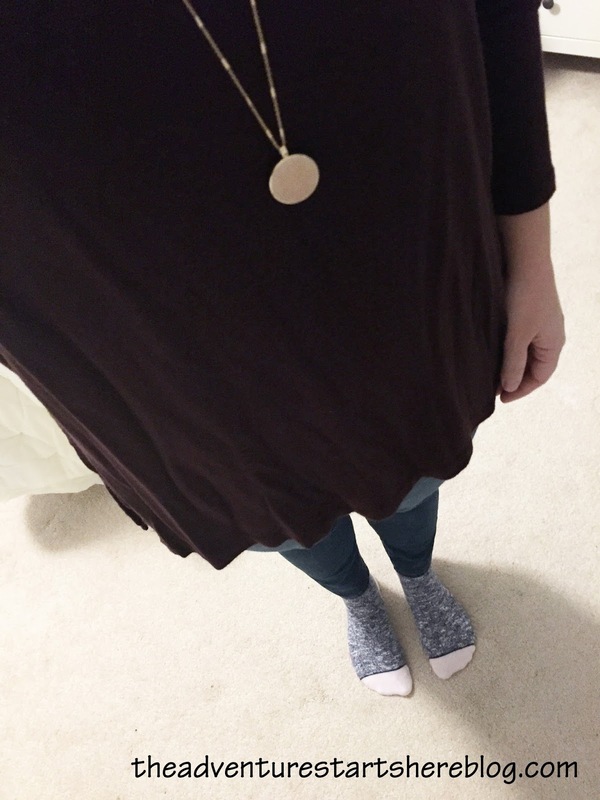 This super soft tunic was the perfect choice. And once again, a necklace really completes the outfit. Have you noticed I wear a lot of jeans, t-shirts, and necklaces? On Monday, Noah and I finally spent the day outside of the house. I took Noah to the dentist and then we met my mom for a little shopping. 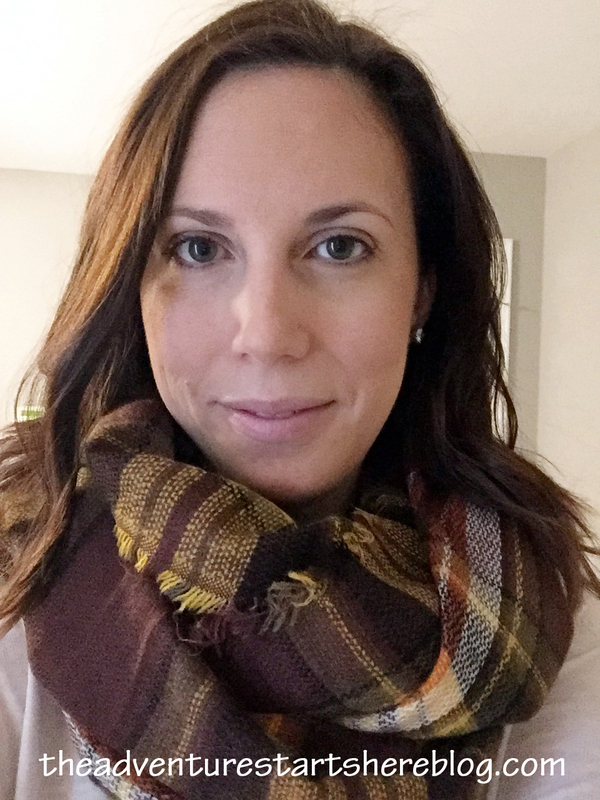 I went with this slightly dressier (because of the camisole peaking out from the bottom) top and added this brown plaid scarf for warmth (it was pretty cold out). 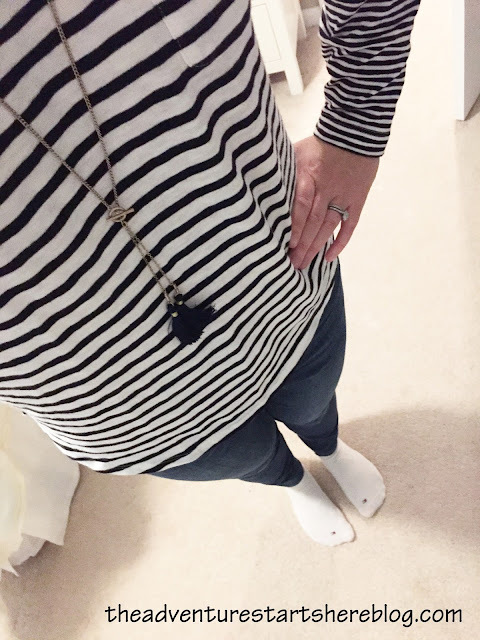 I'm hesitant to even share yet another t-shirt and jeans look, but this is real life and what I wear all the time! I figure lots of you can relate :) On Wednesday, Noah had swim school in the morning. While it's freezing outside, the pool area is so hot, so I have to remember to wear light layers so I don't overheat in there! And finally, another t-shirt and jeans look for a Monday spent at home. I wanted to share this top with you because it's different than other shirts I own in that it's a "cocoon" style tunic. 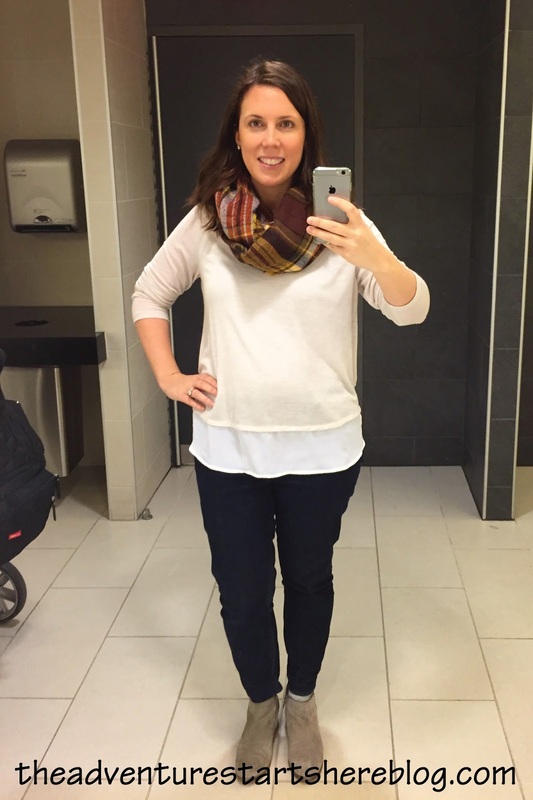 I love how flowy and soft it is, and you can't beat the prices at Old Navy! Do you tend to have a style formula/uniform that you wear over and over? Very cute outfits! How do you like your Loft jeans? 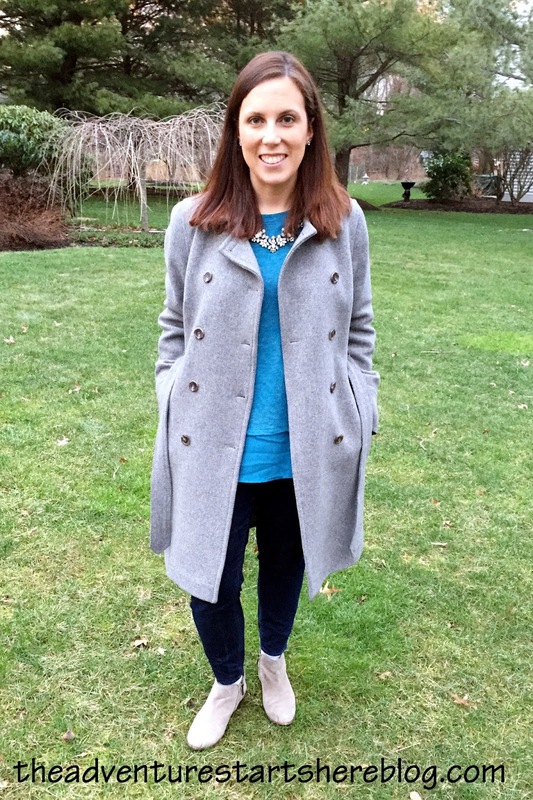 I've been in search of new skinnies and it never even occurred to me to look at Loft (where I shop all the time!). Do their jeans run true to size? Love them all! 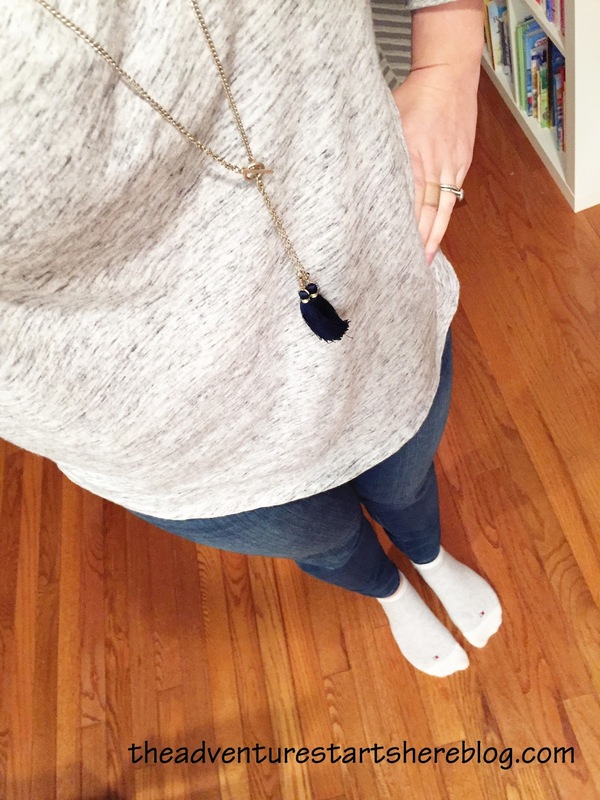 And it's amazing how much a necklace can spruce up an outfit! Love all of the outfits! I need to be better about actually dressing cute instead of just sweats, etc around the house. You inspire me girl!! Ha ha, motivation! :) And I think I need to get some long necklaces. I love yours! im proud of you for putting on real pants every day. so come style me now? 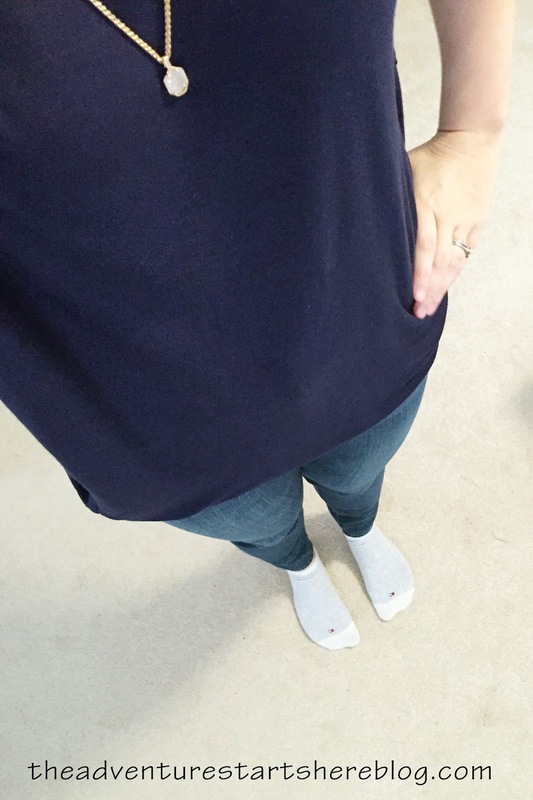 Jeans and tees are the greatest combo ever! I just ordered a few pieces you linked to from ON because they were having a ridiculously good sale! They come next week, I cant wait. I love the idea of these posts and I swear you always look so cute! If I did this, I'd have one week to post and then the rest you'd just see the same outfit over and over. Oops. What is a cocoon style tunic? I saw on ebates that Old Navy is having 18% cash back today so I'm off to get myself a few things and am thinking about picking that up!